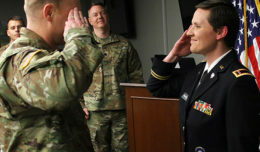 Air Force SSgt. Sebastiana Lopez Arellano was riding a motorcycle when an animal scurried onto the road, causing her to swerve and hit a curb. As she high-sided over her bike, the momentum catapulted her body into a tree. The impact severed her right leg. “I thought I was going to die,” the 25-year-old airman said of the February 2015 crash in Charleston, S.C. While at the hospital, she did briefly die twice before and during a coma that lasted for about a month. The diagnosis was grim for Lopez, now a patient at the Walter Reed National Military Medical Center. Besides an amputated leg, she had several broken bones, ripped arteries and organs, nerve damage and serious hand injuries that prevent her from fully opening them. SSgt. Sebastiana Lopez Arellano, a patient at Walter Reed National Military Medical Center, does pushups during her therapy session at the center’s Military Advanced Training Center, which provides amputee patients with state-of-the-art care, in Bethesda, Md., April 13, 2016. Lopez lost her right leg and suffered several other injuries in a motorcycle crash in 2015. She now uses sports and fitness as part of her physical and occupational therapy regimen. As she recovered, the former C-17 Globemaster III crew chief found comfort in sports and fitness. A year after her crash, she competed in the Air Force Trials for wounded warriors and gained confidence by earning invitations to the Invictus and Warrior Games. In early May, she captured two gold medals in rugby and hand cycling, and three silvers in shotput, discus and in another hand cycling event at the Invictus Games. 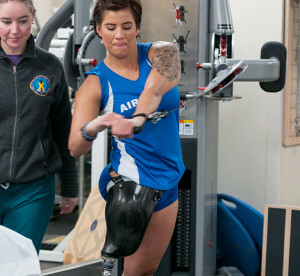 She plans to add more hardware at the Warrior Games starting June 15. Lopez contends in several other sports, such as wheelchair racing, hand cycling, shotput, shooting, and sitting volleyball — the most difficult sport for her to overcome. In 2013 and 2014, she was selected to the All-Air Force volleyball team after playing college volleyball in her hometown of San Bernardino, California. But the extensive injuries have since prevented her from returning to form. Lopez tries to keep a positive outlook as she progresses with physical and occupational therapy that help her improve in sporting events. SSgt. 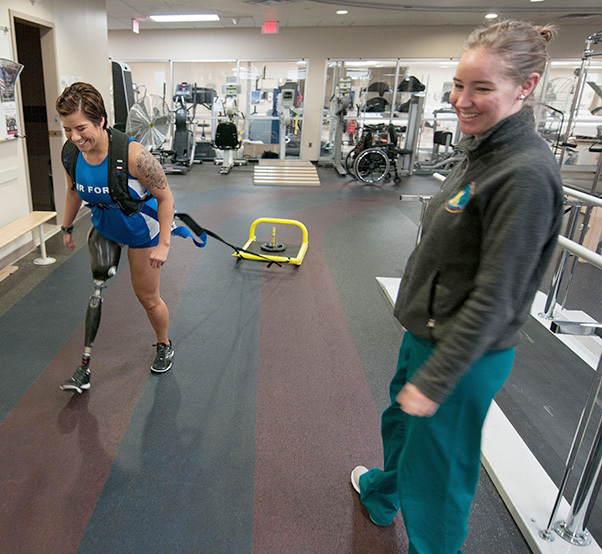 Sebastiana Lopez Arellano, a patient at Walter Reed National Military Medical Center, pulls a weighted sled around a track inside the center’s Military Advanced Training Center. 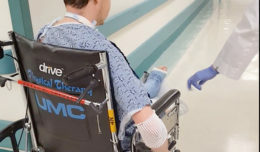 Walter Reed’s Military Advanced Training Center, where Lopez and other amputees receive state-of-the-art care, uses a sports medicine model with various activities and exercise equipment as part of the rehabilitation process. Orr and other therapists aim to inspire amputee patients by instilling a sense of independence after their traumatic experiences. “Despite all of the challenges they are faced with, they continue to succeed,” Orr said, who also teaches basic daily living tasks to help amputees be self-sufficient. Hindered by her injuries, Lopez had to relearn small tasks like putting on her makeup, handwriting and even dressing. “The small victories can add up to a huge victory,” she said, smiling. Her therapy has now advanced to the dancefloor. In the back of the training center, Lopez and a dance instructor often practice moves that would be hard for many two-legged people. The Mexican-American Airman is no stranger to either ballroom dancing or the lively beats of Latin dancing. SSgt. Sebastiana Lopez Arellano, a patient at Walter Reed National Military Medical Center, exercises her upper body during a therapy session at the center’s Military Advanced Training Center. Having fun is important to Lopez, who has struggled with anxious thoughts when out in public with her prosthetic leg. She also makes an effort not to dwell on what lies ahead in life. By staying in the present, Lopez said she and other amputees can conquer tasks that were once thought out of reach.